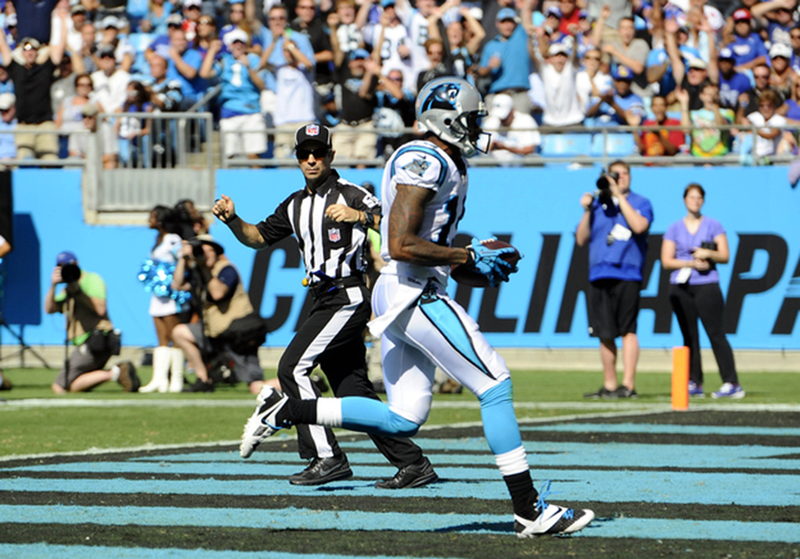 Carolina Panthers' Ted Ginn, Jr. (19) crosses into the endzone for a 47-yard touchdown against the New York Giants in the fourth quarter at Bank of America Stadium on September 22, 2013 The Panthers won 38-0. As Panthers quarterback Cam Newton fired the ball deep to receiver Ted Ginn Jr. on Sunday, the fans in Bank of America Stadium hushed expectantly. Ginn was on a full-out sprint, and that is always a sight to behold. But Newton had really flung it – the ball went 54 yards in the air. “I thought I overthrew him,” Newton said. Watching the ball descend, Ginn had the opposite reaction. Ginn caught the ball, scoring on a 47-yard touchdown to match the 40-yard TD he had grabbed from Newton the week before against Buffalo. Ginn is now the only NFL offensive player with two touchdowns of at least 40 yards so far this season. Playing on a one-year contract he signed in March that pays him $1.1 million – a lot by normal standards, but not much by the NFL’s – Ginn has already become a serious short-term bargain for Carolina. Long-term? Ginn, 28, said he’s not thinking about it (“That’s what agents are for”), although he would like to stay in Charlotte. The Panthers undoubtedly will want him back for 2014, too, if he keeps producing like this. At one point, Ginn was just part of the cast competing for the No.3 wideout role behind Steve Smith and Brandon LaFell, including Armanti Edwards and Domenik Hixon. But for now, Ginn has run away with that job. The upside of Ginn on the field is that he can “blow the top off the coverage,” to use Rivera’s term. Defensive backs are so worried about him going deep that the rest of the field opens up. Newton threw five deep balls to Ginn against Buffalo – a couple of them were overthrown, and Ginn short-armed another – before finally connecting on a fifth. He is getting very used to taking chances with Ginn. After the Panthers barely threw the ball downfield in their first game, a loss to Seattle, they have changed that dramatically. In the 38-0 win against the Giants, Newton targeted receivers 20 or more yards downfield on 30 percent of his throws, according to Pro Football Focus – the highest downfield attempt percentage of any NFL quarterback for Week 3. Ginn isn’t just a receiver, of course. He has been one of the best kickoff and punt returners in the NFL since entering the league in 2007. He once returned a punt and a kickoff for a touchdown in the same game, and in another game he took two kickoffs back for TDs. The first time he touched a return for the Panthers, in the preseason, he went 74 yards for a touchdown. San Francisco kept Ginn around primarily as a returner the past three years. He averaged only 11 catches per season from 2010-12. He ached to be a receiver again, though. He had averaged a respectable 42.7 catches per season with the Miami Dolphins from 2007-09, although he never turned into the No.1 receiver the Dolphins envisioned when they drafted him No.9 overall in 2007. Although the temptation with Ginn’s speed is to say, as Rivera put it, “Line him up wide, tell him to run as fast as you can and then we’ll throw it once in a while,” the Panthers are not using him purely to stretch the field. One of Ginn’s most significant plays of the season came with two minutes left in the second quarter Sunday. With Steve Smith briefly out due to a hip injury, the Panthers faced third-and-11 at the Carolina 46. Ginn ran a slant route, caught the ball in traffic and gained exactly 11 yards, extending a drive that ended with a Newton pass to Brandon LaFell for a touchdown. This is not to say Ginn is perfect. In the past, he has been criticized for dropped passes, his relatively small stature and his lack of physicality. The 49ers basically gave up on him as a receiver. But for the 1-2 Panthers, Ginn has been awfully good so far – a big-play weapon in a sport where you simply can’t have enough of those.